Spring is one of those love/hate kind of things. We love bright green growth that confirms perennial returns. 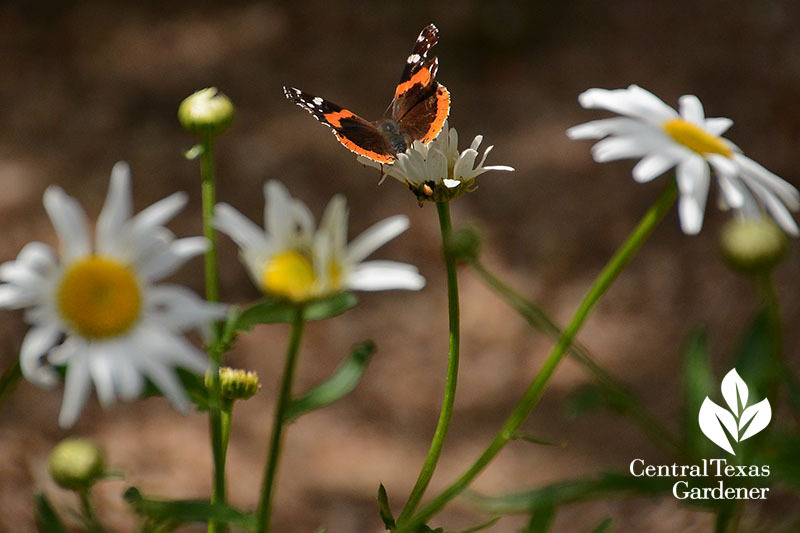 We love all the flowers and the pollinators dashing among them. 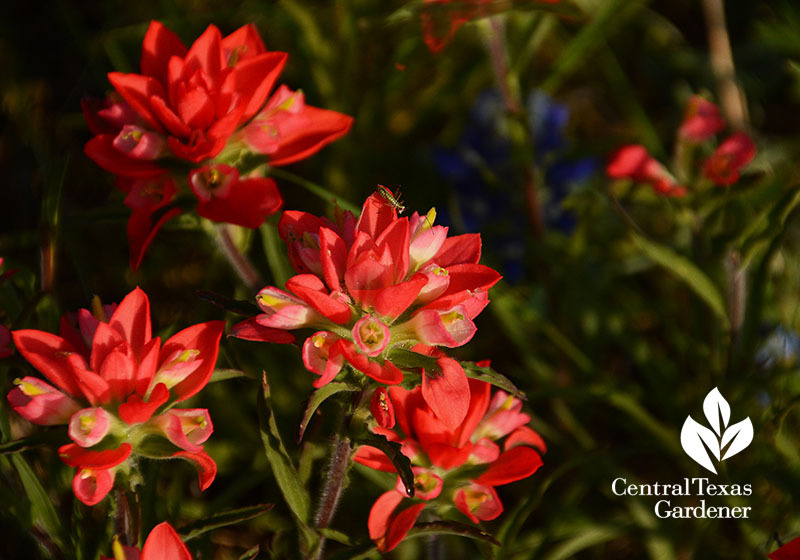 Even our daily drives are more interesting as wildflowers, including Texas Indian paintbrush, spill buckets of color to renew our scenic intrigue. We hate the unpredictable weather, like a record low on April 1 that fooled some buds and tomato transplants. 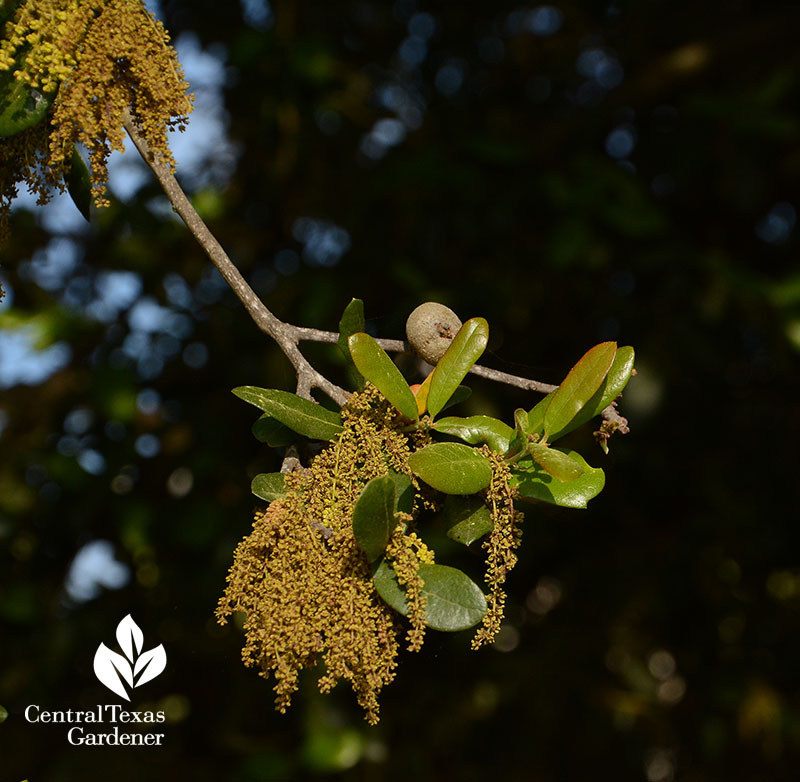 Add to that the physical misery of sneezing, coughing, and itchy eyes that goes along with botanical mating calls, including from oak trees. 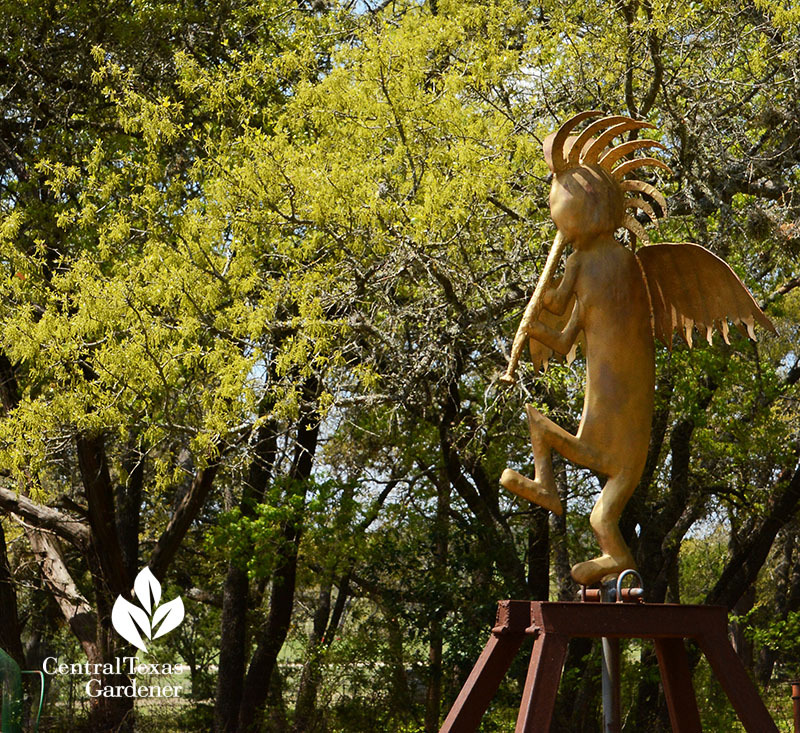 At Solstice Outdoors in Dripping Springs, a sprite sculpture (laughingly) plays underneath an oak tree that’s dusting catkin pollen onto visitors to the nursery, garden art, and art gallery. But all clear soon! Male catkins are pollinating female flowers to produce acorns that wildlife scavenges. Possibly forgetful squirrels plant new trees, sometimes in your soft soil container! 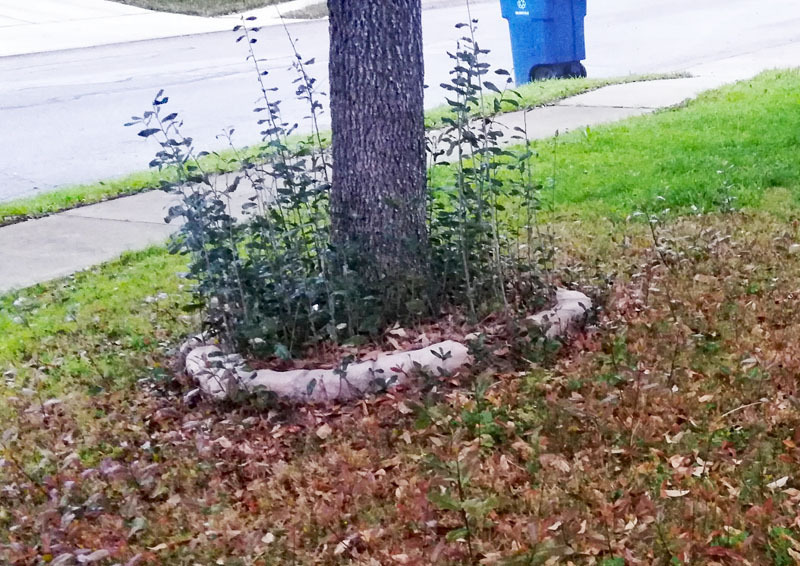 Another way live oaks propagate is through root tree suckers, like for Yvonne Martin in San Antonio. You can’t poison them, since they’re connected to the parent tree. All you can do is mow or cut them. 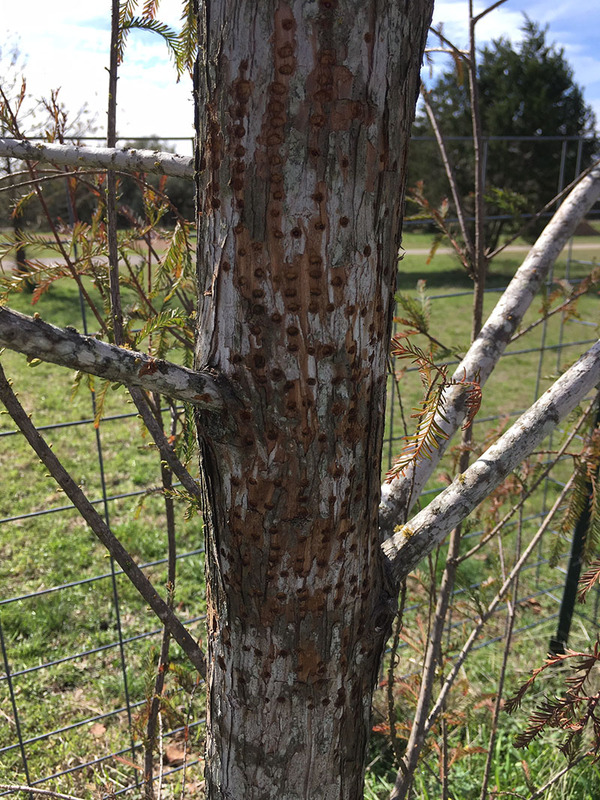 In San Marcos, Mari Sica’s young Montezuma cypress tree really got nailed by sapsuckers. Is it a problem? In this case, it is. Watch Daphne’s answer about oak tree suckers, why some oaks lose more leaves than others, why Mari’s young tree is in trouble, and how Anna and Manny Luiz in Leander protected their plum tree during the March 1 freeze. 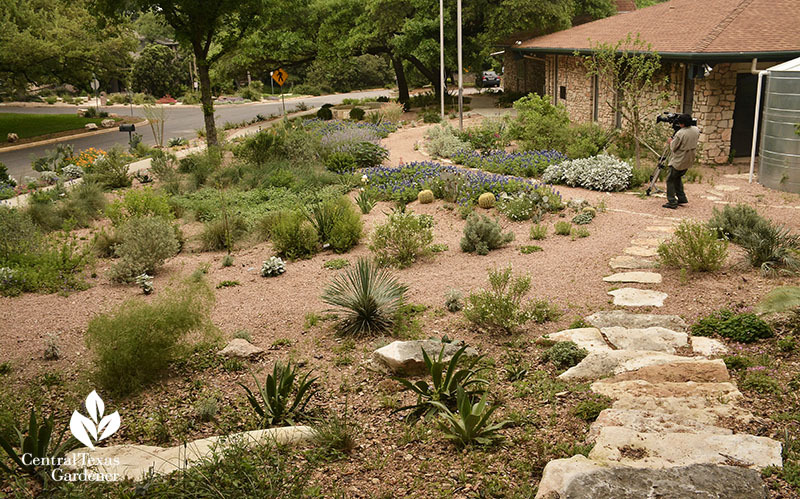 Getting down to planting business, explore native groundcovers with Andrea DeLong-Amaya, Director of Horticulture at the Lady Bird Johnson Wildflower Center. She includes options for sun and shade, including stonecrop and wildflowers. 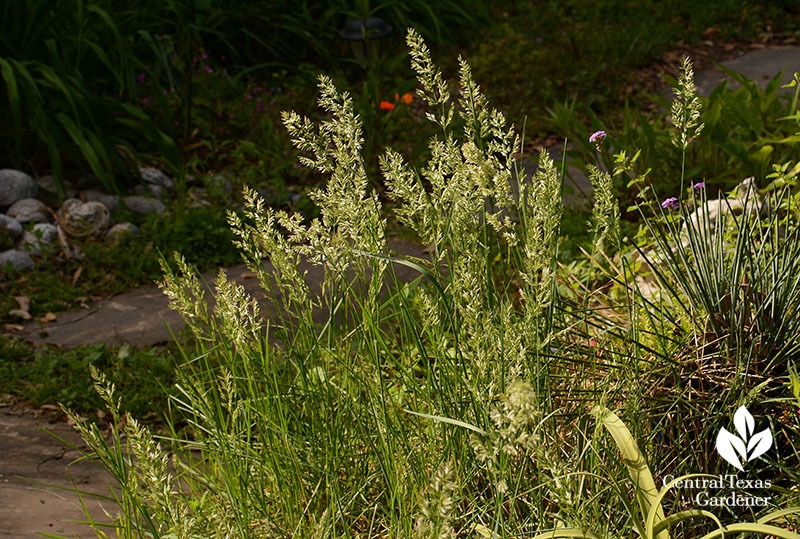 Along with creek sedge and Texas sedge, she brings along Texas bluegrass, Poa arachnifera. Spring blooming and evergreen in part shade, I love this one-foot-tall clumper in my Blackland Prairie soil. Although supposedly it likes moist soils, that’s not the case in my yard. Lyreleaf sage (Salvia lyrata) is one I treasure in part shade. 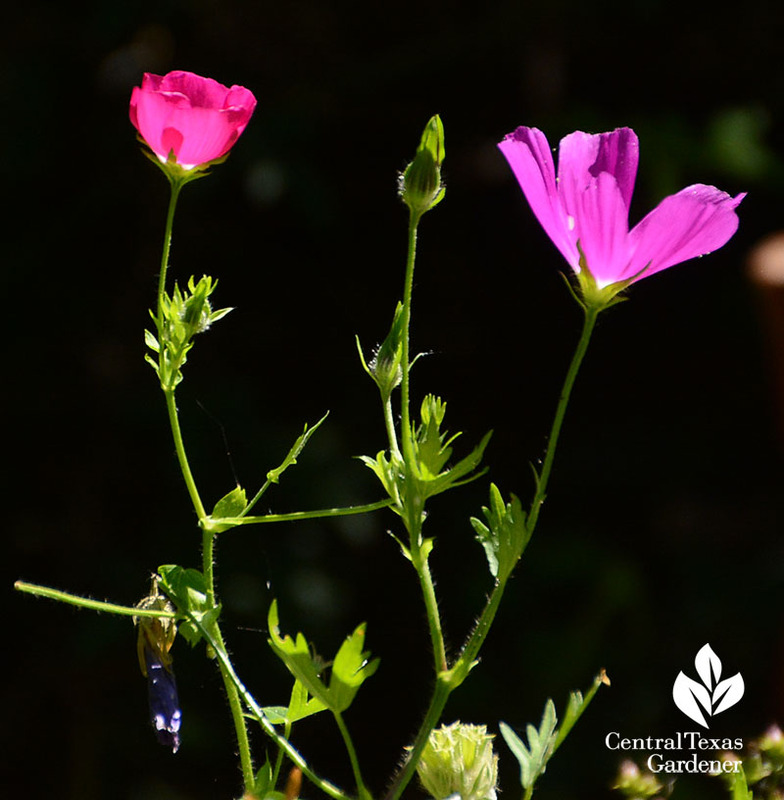 It’s seeded itself in the decomposed granite cracks on a back patio, where its April/May flowers attract bees, butterflies and hummingbirds. An evergreen alternative to ajuga, it tolerates drought and flooding with equanimity, though I douse it a bit when rain misses us for months in summer’s heat. After the flower seeds dry and scatter, I simply cut them back to the rosette. 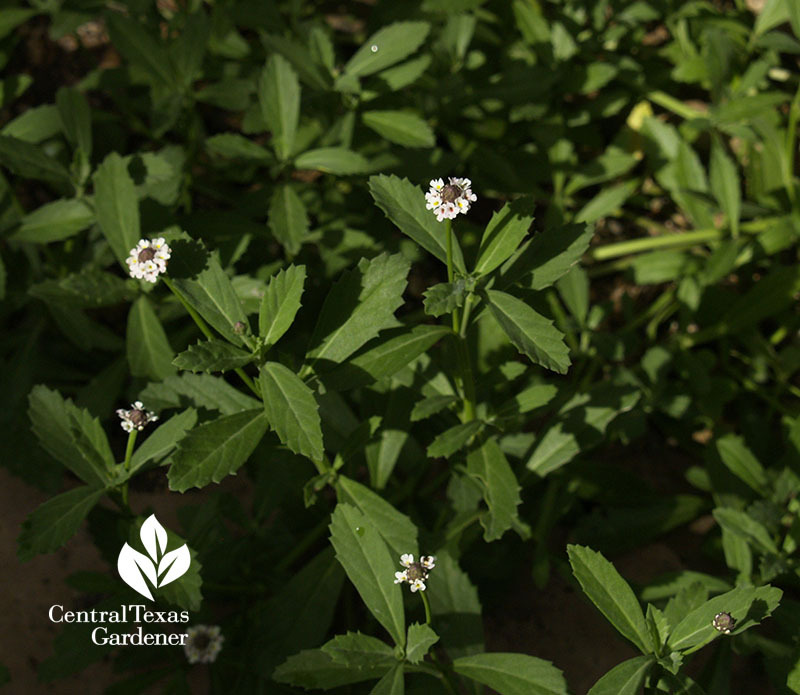 Texas frogfruit (Phyla nodiflora) is just as tough in sun to part shade, attracting pollinators and several butterflies as a larval plant. You can even walk on this one that spreads by stolons. I clip mine back a few times a year to fluff it up a bit. 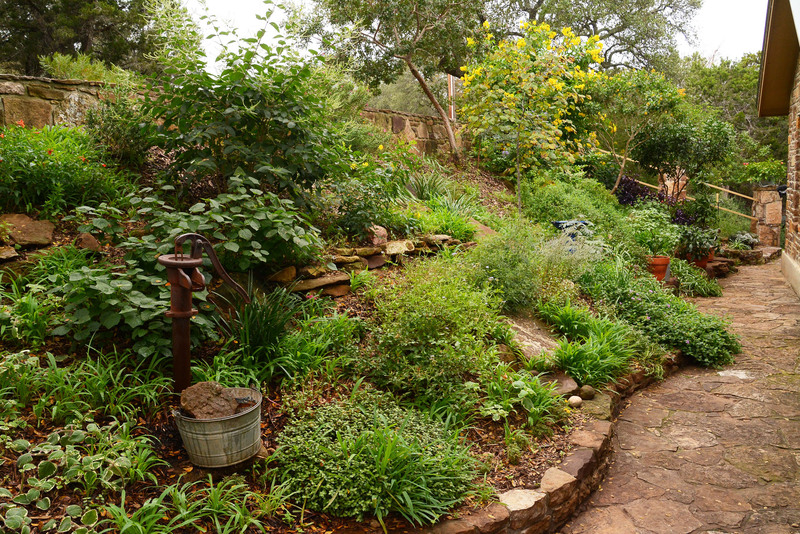 This shot’s from Ida Bujan’s habitat garden in Kyle that we visited a few years ago. Watch Andrea’s interview right now! 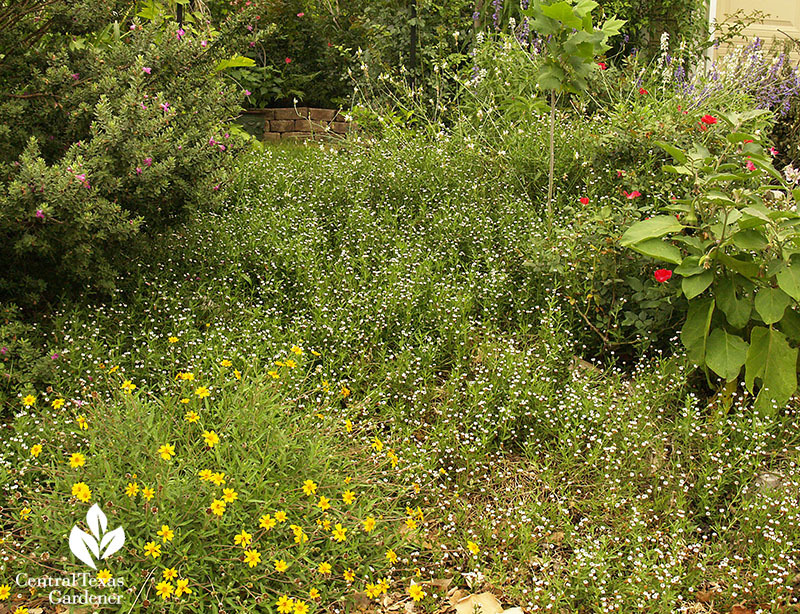 Your septic or drain field can also host lots of wildlife with native plants. 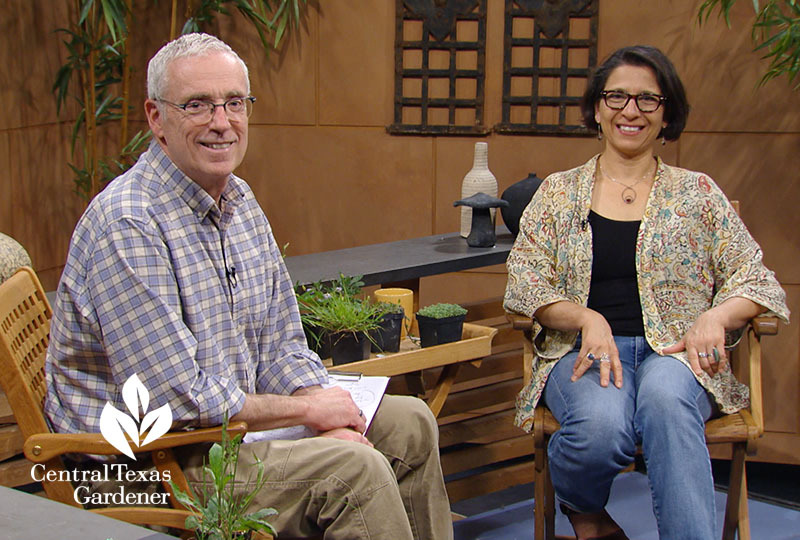 Leslie Uppinghouse, horticulturist at the Wildflower Center, premieres on Backyard Basics with tips on plant selection and how to work with your contractor. Watch now! 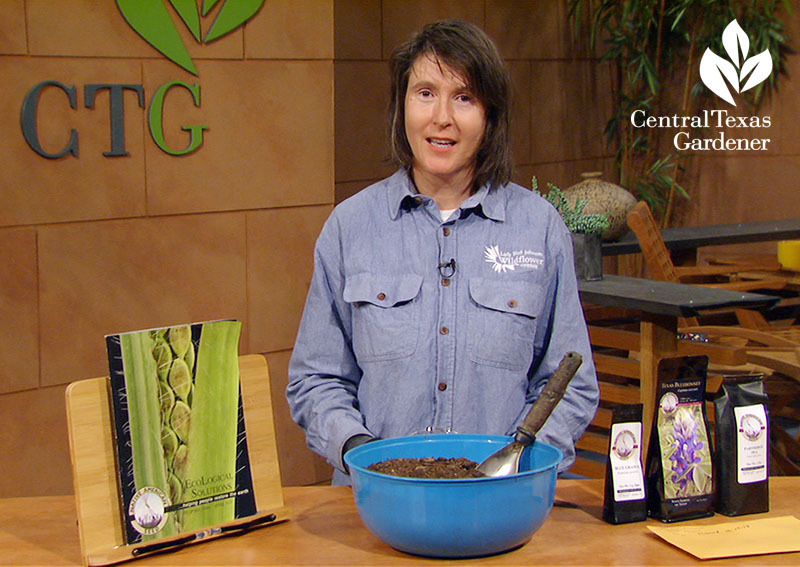 Check out Native American Seed for their leach field/septic field grass seed mix. 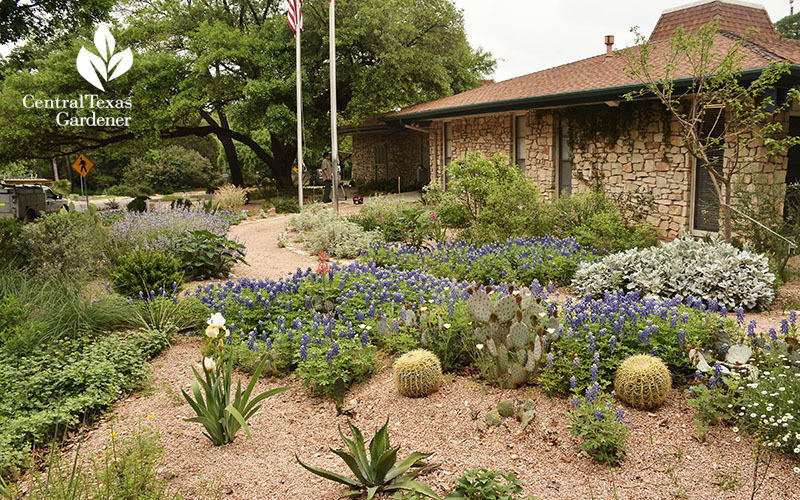 You can fill up your little red wagon with native plants and seeds at the Wildflower Center’s Native Plant Sale on April 12 (members only, but can join at the door) and April 13. 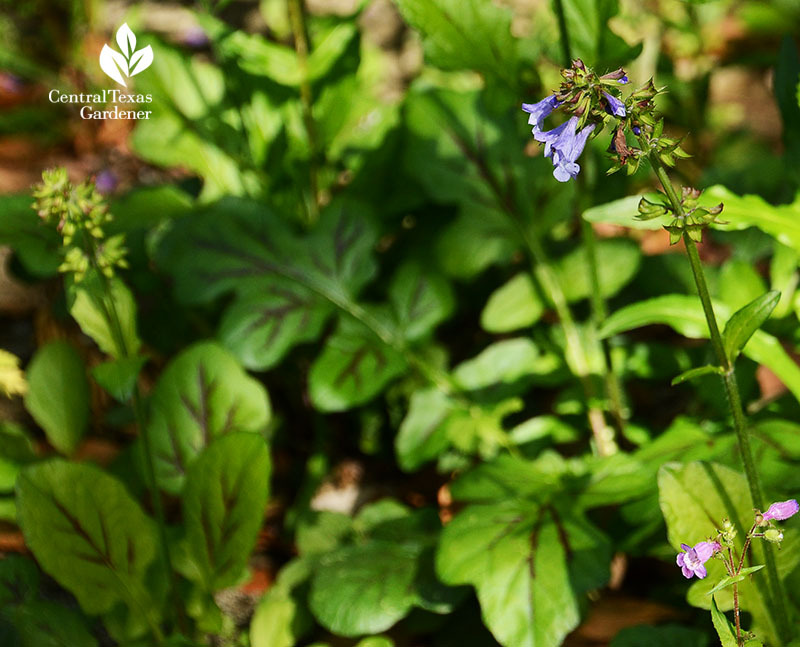 On tour at the Rollingwood City Hall, pick up water-conserving, pollinator-attracting ideas whether you’re there on business or on a daily neighborhood walk. Watch now to see Lauren and Scott Ogden’s design with Patrick Kirwin.